What if we could name and categorize our water protection work here in the Great Lakes as well as we can name and categorize the issues? Yes, naming the work of water protection. Let's look at a few frameworks that can hopefully bring clarity, alignment, and energy to our Great Lakes Commons movement. In our last blog on Unsettling the Commons, Craig Fortier borrowed Chris Dixon's calls for organizing 'within', 'against', and 'beyond' the dominant systems of power. Let's use the issue of bottled water as an example. Working Within: A campaign to get a 10 cent deposit return on plastic water bottles to raise extra money for recycling and stewardship and to slightly deter excessive bottle use through higher prices. A push for more water fountains in public spaces that reduces the need for bottled water. Working Against: Asking the State or Province to change its water permit system so that corporations have to pay more for the water they take from the commons and demanding that bottled water permits should be phased out completely. Working Beyond: Seeding a new water permit authority that a) abides by Indigenous people's consent b) integrates permit data across the entire Great Lakes watershed c) accounts for 'virtual' water withdrawals through all regional trade. These examples are not exhaustive (please leave your examples in the comments section) but hopefully illustrate the point. We can organize about the impacts of bottled water in society and there can be several (sometimes overlapping) strategies to do so. How would you categorize the majority of your water activism? Lack of public participation in water governance. Unfair distribution of water resource benefits. Non-recognition of cultural frameworks from locals and Indigenous peoples. Boelens also names four water justice struggles for change. The struggle over resources. Who gets water access, who pays for water infrastructure, and who benefits from water policy. The struggle over rules, rights, and norms that define how water resources are being used. The struggle over who decides on water rules, rights, and norms. Who has (or claims) authority. The struggle over discourses and representations that ultimately legitimize authority and our relations with each other and with the waters. Could we also add the imagination here too? We could edit #3 on the first list to include the non-recognition of Indigenous rights, rather than just their cultural frameworks, but at least Boelens gives us some categories to work with. What edits would you make to these categories on the types of water justices and the struggles? The list on struggles is important to examine. How much of our water protection work mostly focuses on #1 and #2? How much foundation money also favors these categories? Could these struggles also be seen as working 'within' and 'against' the system? If you are an artist, perhaps you've been exploring #4. If you are encoding or practicing your own forms of water governance that challenge the status quo and align with your community's or culture's principles, perhaps you've been exploring #3. These numbers hopefully don't suggest any ranking or priority of water justice struggle, but open up the range of possibility (depending on how you've been working). GLC has been part of a water justice coalition that started with of a recent summit in Flint Michigan. While it's no easy task, we are figuring out how to address all four struggles together. Each voice offers a needed frequency. What kind of struggle best names the kind of Great Lakes protection that you do? 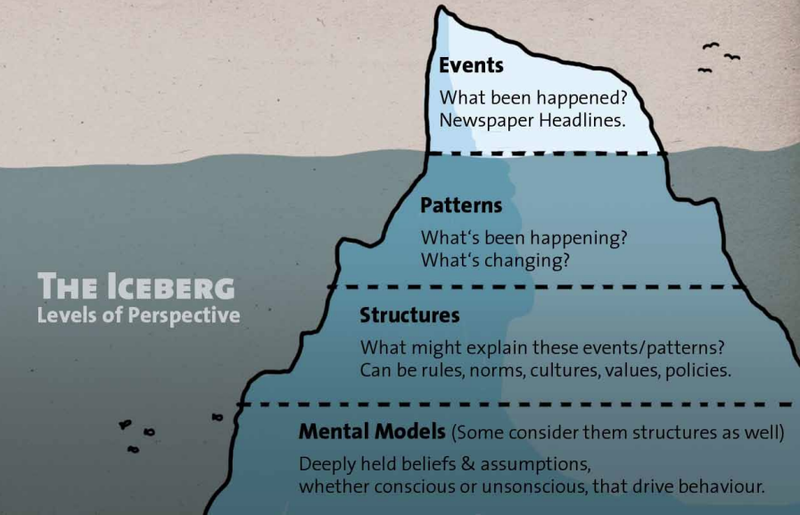 The iceberg image above comes from a Reimagining Activism guide featured in our Charter Toolkit. Without much more explanation, it shows four ways we can think about how we are organizing and prioritizing or water protection. The guide's subtitle is worthy of mention: a practical guide for the Great Transition. If you are reading this you likely already believe that Great Lakes protection requires a great transition. Using the same kind of thinking that caused our crisis of governance will not lead to success. So let's use the tools for transformation, rather than mitigation. In 2017 we led a Water Friendship project looking for ways to understand our relationship with water. We integrated an understanding of Joanna Macy's work on the Three Pillars of the Great Turning. Looking at these four categories of systemic change, which ones are you most active in? How can you build alliances with people, projects, and organizations that compliment your focus? 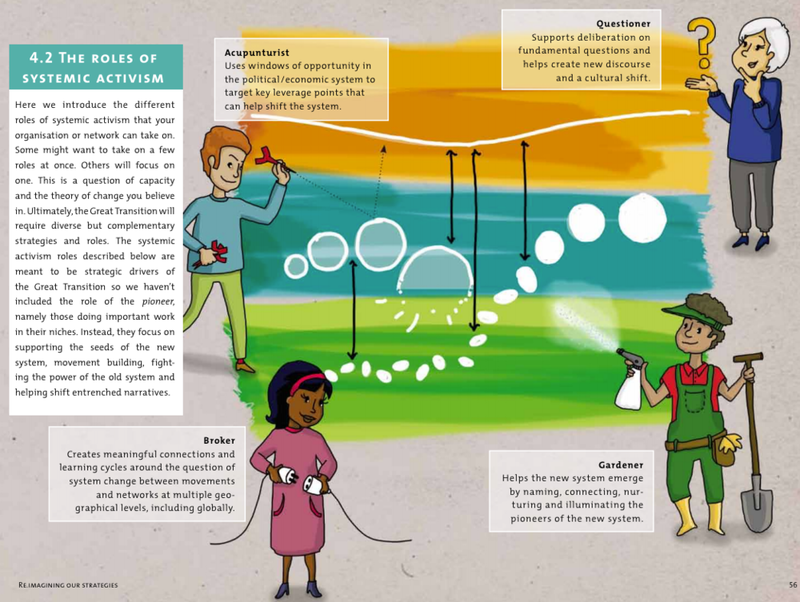 To finish, let's look at the four roles of systemic activism featured in the Reimagining Activism guide. These could be roles within an organization, but for the purpose of this post, let's consider how our water protection projects and organization map onto these roles. The image above explains the roles, but what could be some examples in a Great Lakes Commons? Acupuncturist: This could include actions based on legal principles and opportunities that disrupt business-as-usual. Perhaps this role includes a blockade, ceremony, or boycott that focuses people's attention on the inherent water injustice and offers a moment of re-alignment? Questioner: This could include the roles of journalists, academics, community leaders, or artists who shift our way of understanding what the problems are and how we can collectively advance our mission. Gardener: This could include the roles of funders, innovators, youth, and partners working in allied social movements. All Gardeners help plant and cross-fertilize the seeds of change. Broker: These people are the facilitators, hub-centers, network mappers, and elders who can see the big picture across space and time. Which of these four roles does your Great Lakes work do best at? Where could you build capacity and affinity? Great Lakes Commons offers these various frameworks to create greater clarity and capacity when working across issues, ancestry, and jurisdiction. Since transformative change is our goal, we need to name and support the types of struggle, focus, and roles that meet the challenge. What do you think? Leave a comment below on any of the questions above. Transformative change also needs a community.